VertiRack Enclosed Trailer Ladder Racks, mount to trailer side. VertiRackTM Vertical Ladder Racks for enclosed cargo trailers come in many standard sizes to fit the side of a variety of trailer heights. 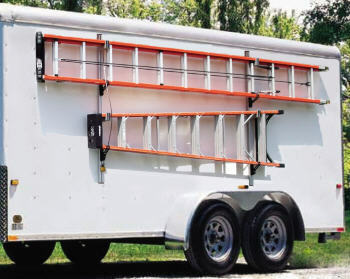 Standard enclosed cargo trailer ladder rack sizes are available to carry two or three ladders and come in heights to span the entire trailer side. 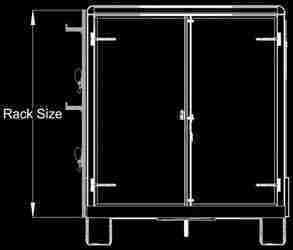 VertiRackTM Vertical Ladder Racks can also be sized to hold just the desired ladder combination and thus be mounted to the structural vertical members of the trailer side. See Universal Ladder Rack Section for this method. Enclosed Cargo Trailer Ladder Rack, Style 10. Enclosed Cargo Trailer Ladder Racks by VertiRack Manufacturing Co.